Apple's iCloud data centers---including a $500 million gem in Maiden, N.C.---remain a mystery, but on the surface it looks like the company chose one-vendor---Hewlett-Packard---for its servers and storage. File this away in the informed speculation department, but Apple displayed rather detailed pictures of its iCloud infrastructure and since we know a little bit about servers around here, we'll make a leap and say we're sure that HP boxes are there. Calls to HP weren't returned immediately. Of course, the more interesting part---what's under the hood of those boxes---remains a mystery, but HP is a start. Why? A one-vendor approach would make sense in Apple's case and Steve Jobs & Co. would want the services contracts. Few vendors could do those services deals. We started with the iCloud announcement photos in question, via Engadget's live blog. Those boxes are quite clearly HP kits in high-density/horsepower racks. HP DL 380 and DL 360 G7 boxes with a mixture of other DL Proliants along with what we believe to be HP external storage systems. Those boxes don't match IBM, Cisco, Oracle or Dell servers. There is an off-chance that the picture reveals Supermicros, but that's a stretch. 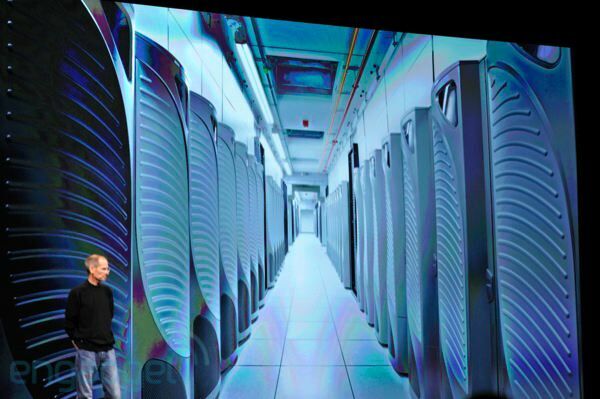 Unless Apple used a stock photo inside their presentation to represent their data center, HP is a key player. So what would go under the hood of these boxes? Red Hat along with a lot of other possibilities, including Apple's own Darwin/x86 OS which is based on FreeBSD. Apple CEO Steve Jobs unveils iCloud At Apple's WWDC in San Francisco, CEO Steve Jobs announces the company's cloud service, iCloud. The service will store content in the cloud and then push it wirelessly to all of the user's devices. Apple is not charging for the service at this time.